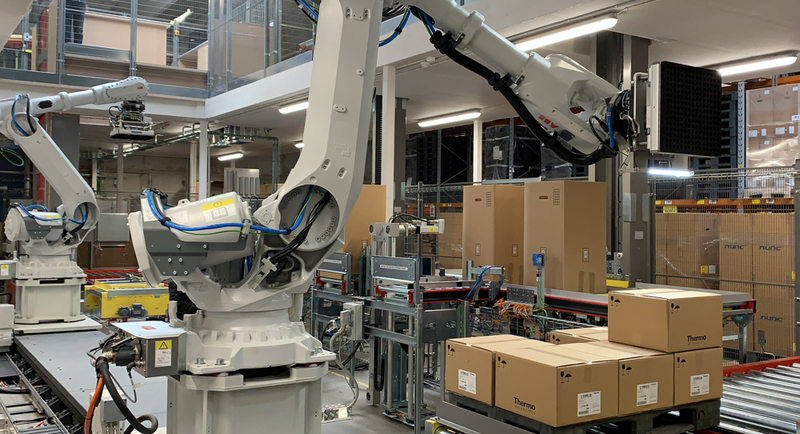 Palletizing and de-palletizing carton boxes by using robots might sound like a simple task. In many cases, this can be done by collecting and grabbing all boxes in one layer, at once. In this particular case, the method above was not an option, as in principle each box need to be handled individually. When these boxes arrive in many dimension variations and unique position patterns, and the position of each box can vary significantly in all three directions, the task gets more difficult. – Did we mention that the boxes might be rotated and tilted a bit as well? In order for the robot to be able to pick (and, later, place) each box with high precision, each robot was equipped with an Allied Vision color camera mounted directly on the tool unit. A laser-lines emitting device was equipped as well, allowing not only the x, y and z position, but also the x, y, and z axis rotations of the box to be calculated, thus providing a full 3D pose. 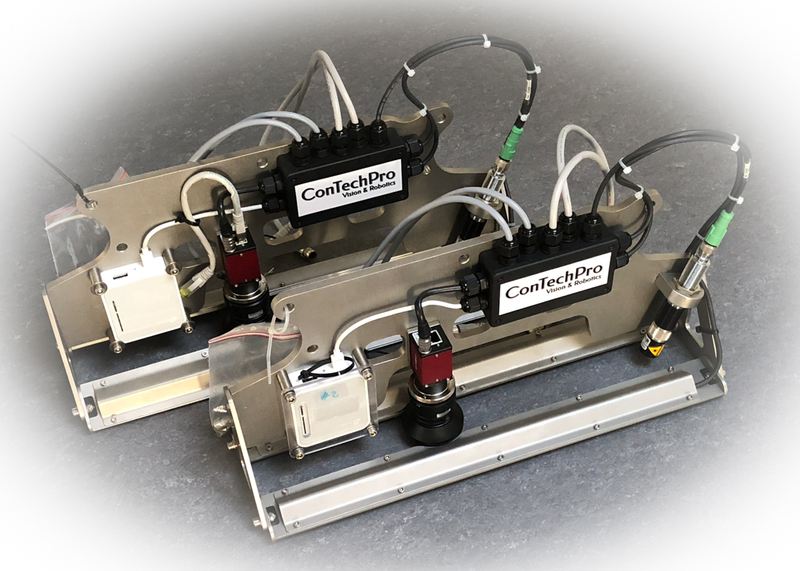 ConTechPro’s ctpFalcon system was customized for this task. The image analysis is based on images from Allied Vision cameras and was programmed in MVTec‘s HALCON. The solution can identify the 3D pose of each box and thus provide the robots with “eyes”. The communication with the ABB IRB-6700 robots goes through a network connection and is interfaced using ABB’s PC SDK software directly from ctpFalcon. As a result of the vision analysis, each robot receives coordinates of one or several boxes, allowing it to pick them, directly. Results are available in due time, such that overall cycle time requirements have been met. The solution was built, for a customer in Denmark, in direct co-operation with the customer.